Tiger Trust is mainly involved in capacity building programmes for imparting legal/technical training for the frontline staff in all the important tiger reserves. It has been working in association with the forest departments, IGNFA, Wildlife Institute of India, police departments, judicial officers, stakeholders and corporate sector. 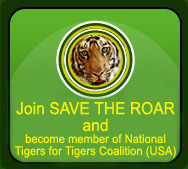 Tiger Trust has the distinction of having excellent faculty which comprises of criminal lawyers devoted to individual subject, retired senior police officers for investigation, sitting session judges, retired forest officers for specialized subjects, experts in forensic science and above all Tiger Trust is blessed with former Chief Justice as its patron. Hence it’s a vertical faculty devoted to the cause for punishing the hunters. Tiger Trust proudly announces the completion of training of one thousand forest staff in the last nine years in seven tiger reserves and has ongoing programmes in several states. It works very closely with important government departments to provide them infrastructure support and advice and is closely working with universities and department of environment in United States. Ms. Anjana Gosain has been a wildlife enthusiast since her student days. Eventually, she took to practicing law. Now, she has got a legal practice of 31 years of standing to her credit, which includes her involvement in nature conservation. She has been conducting legal awareness programmes for the Forest departments in all major Tiger reserves. She has been monitoring and pursuing numerous cases related to wildlife offences, particularly those related to the Tigers. Her recent endevours include the efforts in getting the existing Wildlife (Protection) Act amended in India. She feels that there is a lot of scope for improvement in the existing Act and there is an urgency to make it simplified as well as more stringent on a war footing in order to save the Tigers. Ms. Gosain opines that acting as a bridge between the locals and the government is one of the major tasks of the conservation organizations. The non-government organizations like Tiger Trust has an important role to play, by acting as a complementary and supporting catalyst in the said responsibility. Ms. Anjana Gosain, a long-time volunteer and legal backbone of Tiger Trust, spearheaded the mission of the organization after the demise of Mr. Pradeep Sankhala. Ms. Gosain has been a wildlife enthusiast since her student days. She took the crusade forward by emphasizing the three-pronged strategy of involving the local community in nature conservation, acting as a catalyst between the neighbourhood communities and the government agencies, and going for stringent punishment for the habitual offenders in order to save the endangered Tiger. Anjana Gosain has been appointed by the Hon’ble Supreme Court of India as an observer in Ranthambhor National Park as a member of Standing Committee. She is also a visiting faculty with premier institutions and academies under Ministry of Environment and Forest. This is in addition to her crusade for the local community services. She is also a member of several Eco-Tourism Committees as well. This 52-year-old New Delhi-based lawyer and activist has dedicated her life to the cause of the saving the Tiger as well as conserving its natural habitat. Mr. Amit Sankhala Mr. Amit Sankhala, trustee Tiger Trust, is grandson of Padmashri Late Mr. Kailash Sankhala and son of Late Mr. Pradeep Sankhala. He has vowed to continue the legacy of the Sankhala family by carrying forward the mission of nature conservation. This young tiger-lover and wildlife enthusiast has been putting in new ideas and zeal in to the organization, which includes spreading awareness and mustering support for the survival of the Tiger.